I’ve spoken often — both here on Filling in the Gaps and in other venues — about the usefulness of photography when it comes to communicating shade and desired contour. 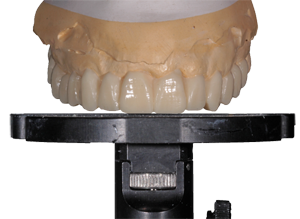 It can step up the quality of your restorative work immensely. The challenge, however, is that proper utilization can be a little more complicated than just pointing your camera at a subject and snapping a picture. This is because, unlike what they say, a picture can actually lie. You’ve probably guessed this already after seeing the myriad of settings and filters found on even the most standard of cameras. Opening the aperture up just half a stop more, or moving even the most innocuous-looking dial one step to the left can change the final result wildly. 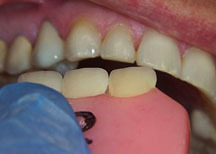 Always take a shade at the beginning of the appointment when teeth are fully hydrated, and before giving any anesthetic. 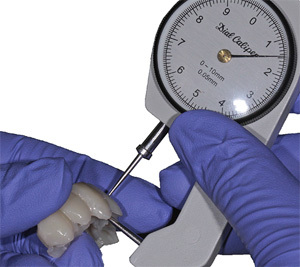 If you wait until after tooth preparation, the enamel will have dehydrated and the value of the tooth you’re trying to match will appear higher in the photo (as it does in Image A above). 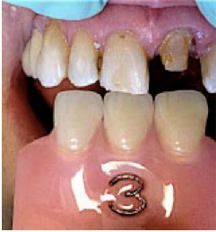 Always ask if your patient is bleaching, has bleached in the past two weeks, or is planning to bleach. 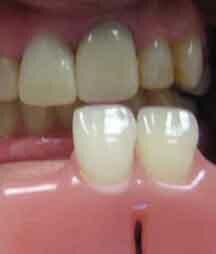 Teeth need 2-4 weeks to settle into color once bleaching is completed. So if the answer is yes, wait until that process is completed before taking photographs. Communicating shade doesn’t require a Fine Arts Degree in Photography, but knowing how to properly compose the frame makes all the difference. Always be sure that your patient is standing or sitting face-to-face with you. If not, there may be a discrepancy in the color’s appearance (as in Image B above). Always hold the shade tab incisal edge-to-incisal edge with the tooth you want to match, ensuring that both the shade tab and the target tooth are on the same axial plane. 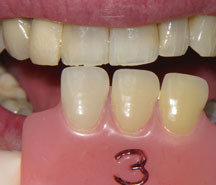 It will be difficult for the technicians in the lab to select a shade if the wrong tooth (namely the one that is being restored) is the one that is being matched (Image C above). 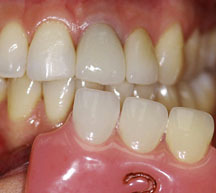 Be sure the tooth to match is fully visible. This may seem like a non-issue, but even with retractors, the upper lip on some patients can sag at the midline and cover the centrals (as it does in Image D). 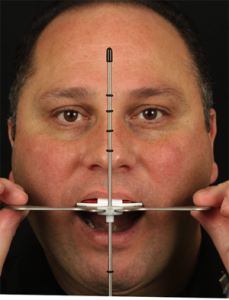 It’s much easier to have your patient simply lift their lip out of the way with their fingers. Choose the right camera and set it properly. If you plan to use photography to communicate shade using a traditional shade tab, it helps to have the most natural light you can in your office for optimal color perception. We recommend daylight corrected bulbs at 5000 to 5500° Kelvin. 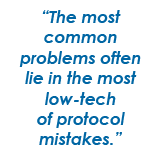 If you’re using a system that lets the lab technician make the selection for you — like our Anterior Expert Kit — this won’t be necessary. With both methods, always use a flash to avoid a shadow from the upper lip (Image E). For this, we recommend a twin flash as it’s less likely to wash out the details of the tooth as some other flashes tend to do. It may take a little additional work on the front end, but, we assure you, the more attention you place on these four essentials, and the more detailed you aim to make your shade photography, the more predictable and life-like your final result will be. Have questions for Joe about the steps it takes to achieve winning photography for shade and contour communication? Send him an e-mail at fillinginthegaps@bonadent.com.